Do you miss Turkey? The country that straddles Europe and Asia hasn’t been the most popular destination during the last few years. Between multiple terrorist attacks in Istanbul, an attempted coup, continued political upheaval, and repeated warnings from the U.S. Department of State, it’s no wonder. But, despite the possible security concerns, you can’t wait to return. You could even skip Istanbul. Turkey’s largest city may be one of your all-time favorites, but you’ve explored Sultanahmet, Galata, and the Bosporus waterfront many times over. What you haven’t seen enough of is the Turkish Riviera. So far, you’ve only been to Bodrum, a popular ancient city. This time, you’re looking farther south along the Aegean coast. You’ll remain in Muğla, the province in Turkey’s southwest corner, but head into Marmaris, a district that borders both the Aegean and Mediterranean Seas. The Bozburun Peninsula actually juts in between the two bodies of water. The rocky peninsula is dotted with ancient ruins and old marble quarries. Quiet fishing villages and hidden bays line the jagged coastline. Sea urchins cling to its wet rocks. Little islets and traditional gulets (wooden sailboats) bob in the glassy water. Symi, a Greek island, is in the distance. While the sweet smell of thyme honey hangs in the air. Bozburun, the small town after which the peninsula was named, lies 30 minutes down a long, winding road. Grey Cape is just lovely. The people who live here are beekeepers, boat builders, and sponge divers. They congregate on market day every Tuesday. Hiking trails fan out from the center of town. They lead to lookout points with gorgeous views. One of the paths, along the east entrance of the harbor, also goes to Karia Bel’. 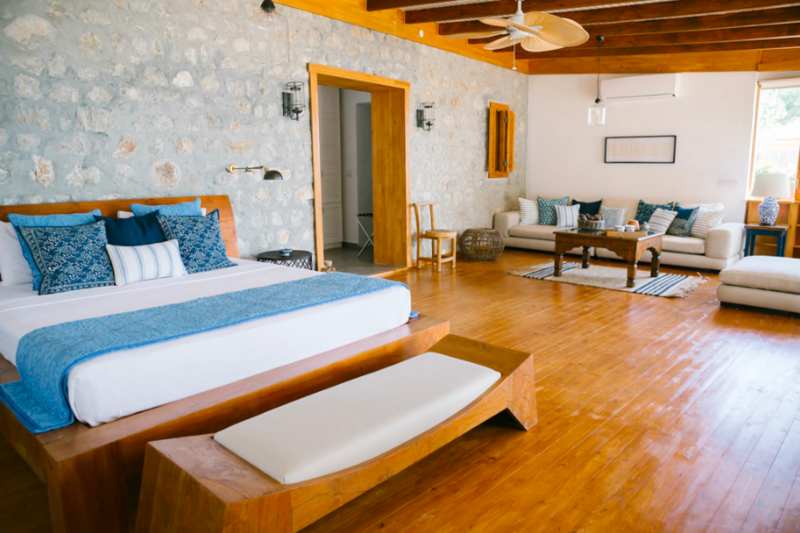 Karia Bel’ is a summer home that’s been turned into a boutique hotel. The stone building was built into the hillside. Sixteen individually decorated rooms look like they’re tumbling down to the sea. An open-air restaurant, floating docks, sunbeds, and paddleboards line the water. Another 10 rooms are at the Karia Bel’ Beach House, just three minutes away by boat. You won’t have a huge agenda at Karia Bel’. First, you’ll select your room. Simi feels beachy. Appolonia has a Balinese vibe. Kasara, the honeymoon suite, has its own jacuzzi. They all have sea views. After warm sunlight starts streaming through your windows and wakes you in the morning, you’ll wander downstairs for breakfast and strong coffee. Bread from a stone oven, homemade jam, organic eggs, tomatoes and peppers, and local cheese are spread out on the long buffet. Then you’ll lie in the sun, jump into the water, snorkel along the shore, and paddle out to Kiseli Island throughout the day. 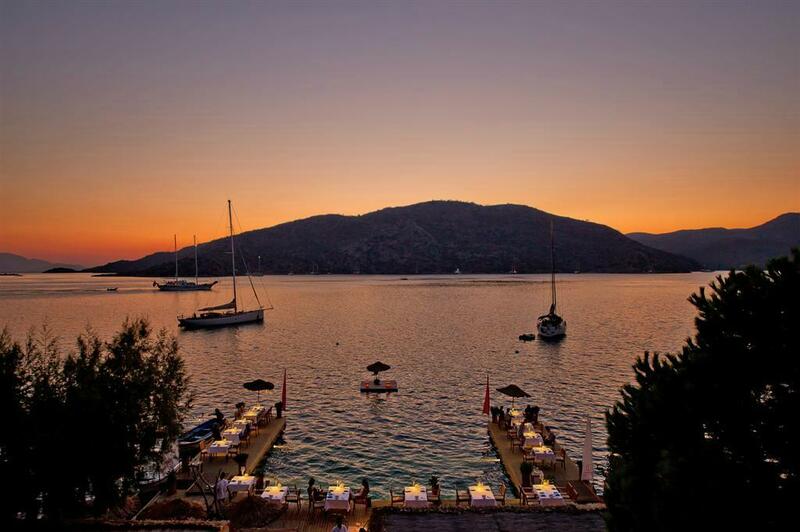 You’ll watch the sun set as you sip local wine back on the dock. A long seafood dinner, featuring mussels and swordfish, will follow. There are no crowds or worries in this part of Turkey.